Admittedly I was not a very good student in art history when I was in university, so I was only familiar with Alex Katz by name prior to seeing the gorgeous retrospective of his prints currently on view in the exhibit Alex Katz: A Life In Print at the Bellevue Art Museum. The BAM is a cool jewel of a museum just east of Seattle which apparently devotes a significant part of their programming to printmaking and graphic arts. Indeed the other major exhibition at the museum when I visited was a retrospective of Mexican graphic artist/printmaker Jose Posada and the penny press in turn-of-the-century Mexico. Posada and the Mexican penny press... that's going deep into graphic design history. Major props. The Katz exhibition was the entire third floor of the museum, and included well over 50 works, selected from the largest private collection of prints in America, the Jordan D Schnitzer Foundation, and included a series (Face of the Poet) on display for the first time ever. For those that are also unfamiliar with him, Alex Katz is a NYC based painter and printmaker who has been working since the 1950's and has become a living legend in the world of contemporary New York City art scene, and a contemporary and friend of many of the biggest players in the New York art and fashion scenes. 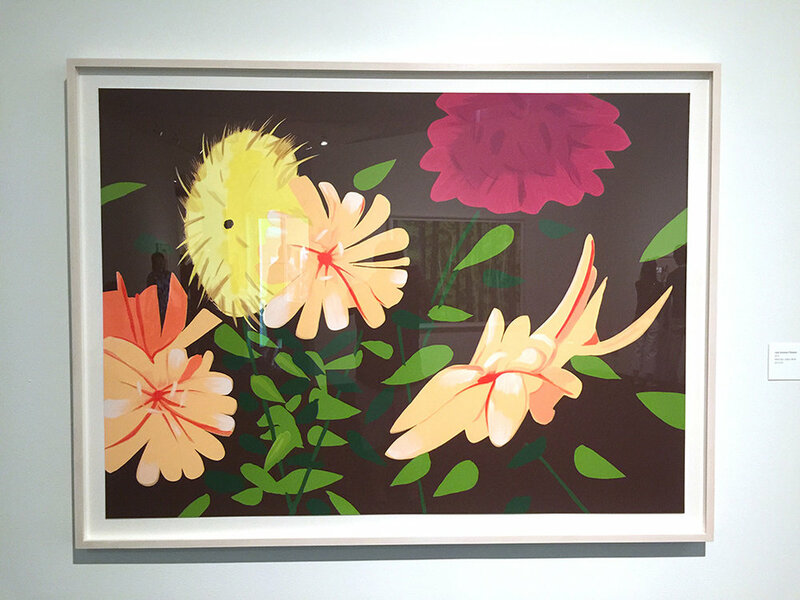 His large-scale prints and paintings are bold, colorful compositions featuring flowers, landscapes and portraits (of himself, his wife, and friends), mostly flat tableaus that eschew minute details for a larger representations of form and design. His screen prints are elegant examples of expertise in color harmony and a control of line. The clean, flat shapes whose delicate placement work to create a gorgeous image are almost comic book in nature. There's a heavy influence from graphic design and fashion illustration in his portrait work, but not so much that it detracts from the intense stares and vivid personalities of his subjects. The graphic beauty and bold illustrative style of his work only heightens the drama, comedy, or romance of his subject's story. Katz's bright world is a celebration of all the beautiful things in life, and in the show at the Bellevue Museum, an invitation to admire his personal life. The numerous portraits of himself and his wife in the series Alex and Ada, the 1960's to the 1980's engage the viewer in the same way vintage photos have us guessing at the context of the scene and the emotions of the subject. Their portraits are peppered throughout the exhibition, giving us a view of their personalities through Katz's interpretation of their life in stills, while savoring his understated historical details in the clothing and hair. While many of Katz's subjects in the prints at Bellevue have a melancholic or stoic demeanor, the Black Dress series - the gem of the exhibition - revels in playfulness. The larger-than-life depictions of a series of different women, all in the same pose wearing variations of the "little black dress", capture the joy of repetition like a visual fugue, and invite us to appreciate the uniqueness of the individual in the midst of a pattern of uniformity. Alex Katz: A Life in Print, Selections from the Collections of Jordan D. Schnitzer and His Family Foundation is on view until October 14, 2018. A Life in Print is presented by Bellevue Arts Museum and the Collections of Jordan D. Schnitzer and His Family Foundation.